YouTube Lied to Many Creators in This Year - Many YouTubers around the world srceam and protes about new YouTube rules. YouTube said will reviewed after reaching 10,000 views and be patiens to wait and we will sent email to get monetize your video. Day by day million money research out for create original viedo as the guidelines. 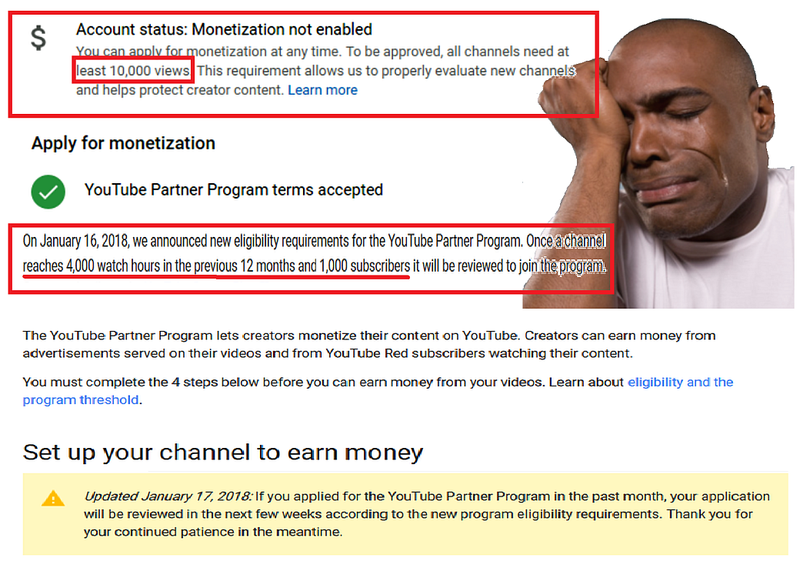 Fact Youtube Monetize Policy released on January 16, 2018, announced new eligibility requirements for the YouTube Partner Program. Once a channel reaches 4,000 watch hours in the previous 12 months and 1,000 subscribers it will be reviewed to join the program. Nothing from any support tim notice in December to review 10,000 views on that. New YouTube rule or policy in December designed pending to most creator who get qualified with the rule but, YouTube moneteiz tim do nothing just keep silent like they said before. This options intentional to the latest rule policy in this January 2017 to get reviewed after reaching 4,000 watch hours in the previous 12 months and 1,000 subscribers. Think they must released the monetizations wich follow the guidlines in 31 December or before the new rules come out. Most of people now satisfying, disappointed, frustrated upon reaching new YouTube 2018 Policy. Your YouTube channel is automatically wasting time for new creators until reviewed to make sure that it complies with the YouTube Partner Programme terms and Community Guidelines. The December email, usually within a week but until month YouTube LIED to many creators. 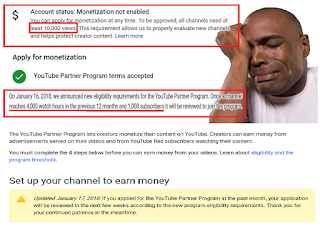 This YouTube Lied to Many Creators in This Year article just to support a new YouTube creator's who eliminated in monetization program these last months, and hope to YouTube monetization Adsense tim to review his new rules reached with due regard to previous regulations. New rules appreciated by many creators but as a proffessionals should approve what has been achieved reached the target according to the previous rule, before the new rule is executed. If you agree with us you can share this bumenmedia post in many media until the the YouTube tim appreciated new creators who get 10000 views in the last time before they decided to upgrade program while something wrong behind their accounting get dropped not to cleaning the reuploader or YouTube spammer thath not follow the guidlines. Thank for your time with us.